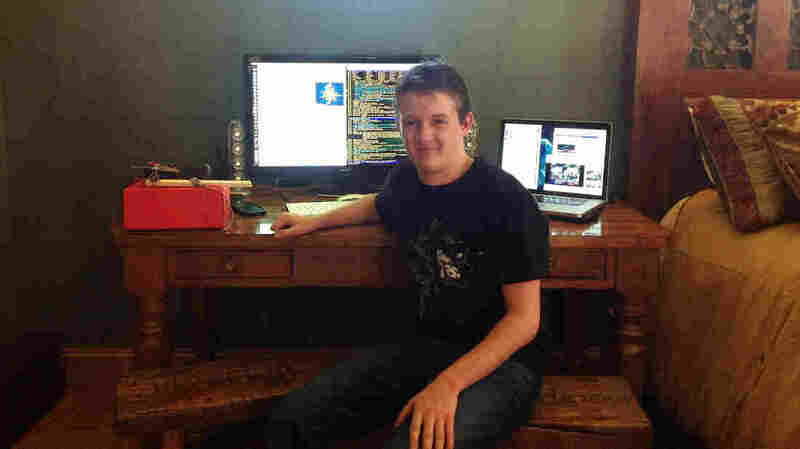 'Techie Computer Programmer Guy' And The Website Reddit Deliver The News : All Tech Considered Shortly after the Colorado shootings, a Denver 18-year-old named Morgan Jones started a thread on the social media site Reddit. It built through the night into a minute-by-minute chronicle of tragedy. Morgan Jones, an 18-year-old from Denver, gave minute-by-minute updates Friday on the movie theater shootings in nearby Aurora, Colo.
By the time a lot of professional journalists awoke Friday morning to learn about a mass shooting inside a Colorado movie theater, 18-year-old Morgan Jones had already been providing minute-by-minute coverage to a rapt audience for hours. A gunman opened fire on the audience at a midnight screening of The Dark Knight Rises in Aurora, Colo., on Friday, killing 12 and wounding many more. The dead include a U.S. Navy sailor and an aspiring sportswriter. One man was celebrating his birthday. Another died shielding his girlfriend from the bullets. Jones, a recent high school grad in Denver and a self-described "techie computer programmer guy," started posting on his favorite Web platform, Reddit, as soon as he learned of the shooting from a 30-second-old Facebook post from Denver's NBC affiliate, KUSA. "I was like, oh my gosh, this is a big thing," Jones tells All Tech Considered. "Facebook] users posted a link to the Aurora PD scanner, so we turned that on and started listening. Immediately it was evident that the situation was not good at all." Jones says he and a friend then turned to Reddit. It's a crowd-sourcing online community that New York magazine calls the largest Internet message board in the world. (New York's recent profile reports 35 million users sign on to the site each month.) What users like Jones value most about Reddit is the community's participation in conversation and in "voting up" and "voting down" links or stories of interest. "The most popular stuff always bubbles to the top so people can see it," Jones says. "If users can't decide what's on the front page in some fashion, they don't have a voice. Reddit gives you a choice." 1:42: "All ten people in the theater are black." Fatalities. 1:43: Report of a bomb going off in a theater. 1:47: Command staff briefing. This is huge. 1:49: Car, Tennesee plates, Hyundai, license [redacted]. third to west, in front of doors. Possible bomb. Main entrances of mall covered. Bomb squad moving in. 1:53: Canine units coordinating at SE entrance between JC Penney's and the food court. May be a bomb in there. Theory that bombs may be in front of theater. Jones' proximity to the shooting, speed and comprehensiveness led other users to promote his timeline widely, rushing the account to the top of the Reddit home page. Social media networks like Twitter and Facebook have become part of the fabric of news stories — or the story itself — in recent years, notably during the Arab Spring. But in the hours after the Aurora shooting, the abundance of eyewitness journalism and conversation on Reddit turned the news aggregator into a surprising source of information on a national story. Reddit is a notably utilitarian site — it doesn't have flashy design and it has no formal editorial structure — but thanks to the engagement of its community, the site keeps its audience up to date. Like many social media sites, however, there's no guarantee of accuracy. Jones, who made corrections to his timeline in real time as more information came in, says the Reddit community's demand for transparency keeps his work accountable. "I don't delete things and replace them with something else. I do a strike through and put what [latest information] I have below it so it gives people an idea of how it's changing. So it's transparent," he says. "People will put up with minor inaccuracies because they know someone will call them out and change it." Some mainstream news organizations shared images posted on Reddit shortly after the shooting by a man who said he was wounded. He wrote: "I am one of the 50 wounded in the aurora theatre shooting. here are a few photos of my very lucky but nonetheless terrifying brush with death. my thoughts go out to those less fortunate than me." Another alleged victim reached out for support on Reddit to "calm" her nerves. "Someone came into our theater at the midnight release of Dark Knight Rises and began opening fire. Who here on Reddit can help me calm my nerves?" she posted. This led to a personal conversation between the user and the commenters, some of whom claimed to be other victims. "Thank you for the well wishes everyone. Heart is still racing," she followed up. All this — and coverage by Buzzfeed and Time — has made Jones an unlikely celebrity. So why did this 18-year-old "Redditor" stay up all night? Jones says he felt a responsibility to the Reddit audience, and to history. "I think journalism has sort of taught me that. When there's an important event I just think it's important to chronicle it some way or another," he says.